from global talent shortages or an aging workforce. 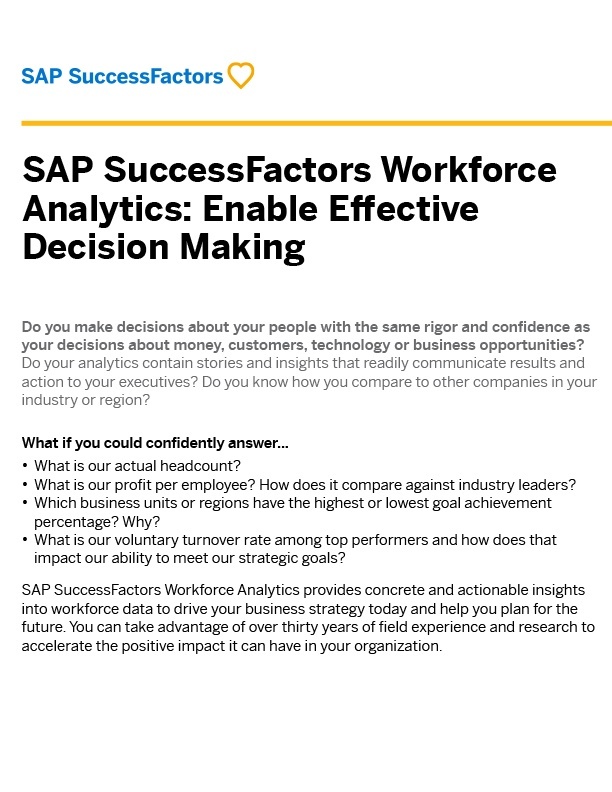 SAP SuccessFactors Workforce Planning helps you understand and close the gap between current and projected talent needs can make all the difference in your ability to execute strategy effectively. Built for business execution and fully integrated with SuccessFactors, Workforce Planning enables “what-if” scenario planning and analysis, so your leaders can act with confidence and a clear understanding of the financial and operational implications of your plans. Proper planning results in improved short- and long-term recruiting, succession, learning, development, performance, and other workforce initiatives. With more than 30 years of expertise in designing workforce plans, developing strategic interventions, and defining, integrating, and interpreting workforce information, we have embedded our proven methodology with a bank of workforce risks and mitigation strategies into the technology.